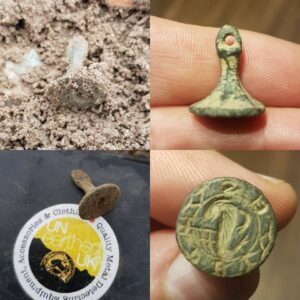 Its been at least a few weeks since I did my last blog on here, with a busy period for us at unearthed ive let a few detecting sessions slip through the net, so Im trying frantically to catch up! Both myself and Garry have had a decent run, Roman coins coming to light, some nice artefacts, one or two Hammered coins and a touch of Viking too, the weather has been hit and miss with some days seeing us diving for cover to get away from the heavy showers, with this in mind it takes me to our latest adventure from last weekend. A brisk 10 minute walk from car to field saw us rowing up and down a gentle slope, I was slightly above Garry but going in opposite directions, he was using his trusty Fisher F75 whilst I was once again wielding my Teknetics G2+, getting comfortable with my spade over the shoulder, phone on silent, and harness in position I was off, within a few minutes I was down on my knee holding a strange looking artefact, whilst at the same time Garry was making his way towards me with a clod in his hand roughly the size of a cricket ball, half emerged was a nice looking Roman brooch with what looked like the pin still attached,what a good start! I joked with Gaz saying I hope thats not it for us finds wise, soon after I started regretting that sentence as for the next couple of hours we were dogged by lead, shotgun cartridges and the usual array of Buttons, it wasnt until I moved to the opposite side of the field that I hit my next decent target, an I.D of 55 and a sharp audio tone had me scrambling around in the loose soil for the target, I glimpsed what looked like the edge of a coin and quickly I revealed a really fresh looking Half-Cut Hammered coin of Henry the third, if this coin was full it would have been a thing of beauty! 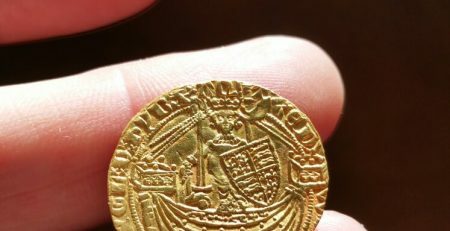 How many cut halves have we had over the years that would have made stunning full pennies! I made my way back over to Garry, showed him the coin and we decided it was Lunch-time, drizzle set in as the skies darkened and we found ourselves eating out pack up in a small wood for shelter, 15 minutes later we were back at it, this time we headed to a large, long narrow field nearby which again had produced some decent coinage etc in the past, a short walk of around 20 yards had me hitting my second signal of the afternoon which turned out to be another Roman Brooch, this time minus the pin, a great start again I thought but once again targets struggled to emerge, after 90 minutes or so a couple of well worn bronze roman coins came to light for both me and Garry and I winkled out a broken, small Celtic Terret ring, by this time it was 3 o’clock, and an air of frustration had set in, for the previous hour I had been eyeing up another field close by that had produced some nice Hammered and a nice seal a few years back so I gambled and decided we should check it out, a hike of around 15 minutes seen us arrive on it just as the rain set in, we literally had a couple of hours left so getting wet wasnt an issue, soon after heading up near the old road I started hitting old copper coins, broken buckles and other broken pieces which is always a good sign, a half decent Roman bronze showed its face and I was sure something half decent would emerge, and luckily for me it did, I cant remember the ID numbers on the screen but the target was a whispy signal that begged me to dig it, down around 5-6 inches revealed a superb Medieval Chessman type Seal, its legend was hidden due to the mud but once home and a post on social media had the seal experts informing me it was the Lamb of God hidden in the design, the wet weather was soon forgotten, I was really happy with this as I have a soft spot for finding them, certainly up there with my top medieval artefact finds! By the time I had shown Gaz the seal it was raining quite heavy so we decided to call it a day, but you can bet your bottom dollar we will be back on that field once again soon! Keep finding and stay lucky! !